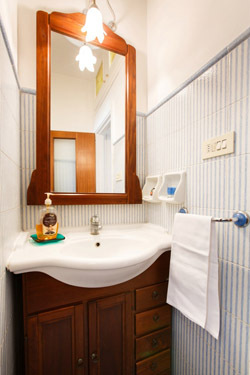 Nonna Netta apartment is on the first floor of a modern building with lift, in a peaceful area in Sorrento center. 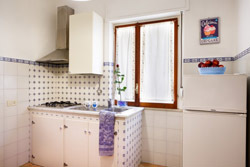 Nonna Netta apartment lies on the first floor of a modern building, in a quiet spot in Sorrento center with parking-car. 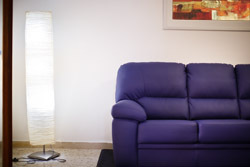 Equipped with an elevator which can be used also by confined people on the wheel chairs. It is a three-room apartment of roughly 80 sqm, modernized in early 2016 and furnished with taste. It can host up to 6 guests. The layout of Nonna Netta apartment consists of a large living room with dining table and chairs, (a single bed can be added in the room in case of need). The kitchen is independent, but near the living/dining room. The sleeping area consists of a double bedroom, a bedroom with three single beds. The bathroom has shower. Netta Nonna apartment is equipped with a terrace with table and chairs. Lift, Air Conditioning, Heating, TV, Internet Wi-Fi, Car Park, Tourist Office, City Maps, Iron.. The air conditioners’ filters are cleaned continually and the wall paint of the apartment is antitoxic and anergic. 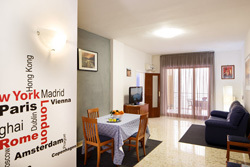 The apartment's security measures were controlled by an authorized engineer and strictly observe the European safety standards. E.g., in the kitchen specific ventilation holes were made in case of accidental leakage of gas. In addition, the house is equipped with a fire extinguisher checked annually by authorized staff.